We have been blessed with Greg Heffley (Diary of a Wimpy Kid), Big Nate, Tom Gates and most recently Duane (My Totally Awesome Story), characters who grace the pages of books that have a huge appeal to boys ( and plenty of girls), books with a mix of text and illustration, all sharing the common theme of humour, usually at the expense of the main character! 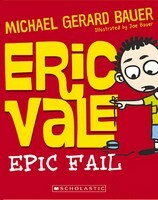 Now we have another book to keep these boys reading, meet Eric Vale, who has managed to score himself the worst nickname of all time, Eric Vale, Epic Fail. This book is chock full of characters the readers will love, there’s obviously Eric himself, his best friend Choo-Choo Rodriguez, Big Bob, Martin Fassbender (the genius who thought up the terrible nickname!) and poor old Mr Winter. In this book we will read about a self portrait made from guinea pig poo, an embarrassing incident with a lapel mike that wasn’t turned off and an even more embarrassing incident that involves teddy bear pyjamas that become see-through when wet! There’s also the character that Eric writes about when his mind wanders, Secret Agent Derek ‘Danger’ Dale, his stories involve belly button fluff, holey undies. Fat ninjas and Doctor Evil MacEvilness. While all this hilarity is going on, there’s also a very quite character, the new girl Aasha Alsufi, from Somalia. She is very shy, and often looks very worried at the antics going on around her. It’s not surprising that our unlikely hero, Eric is the one person who figures out what will turn Aesha from a worried wall flower, into a smiling laughing member of their class. This will appeal to those who want something quick and funny to read. While there is a storyline running throughout, it reads like a series of unfortunate incidents, each one is like a short story of it’s own.